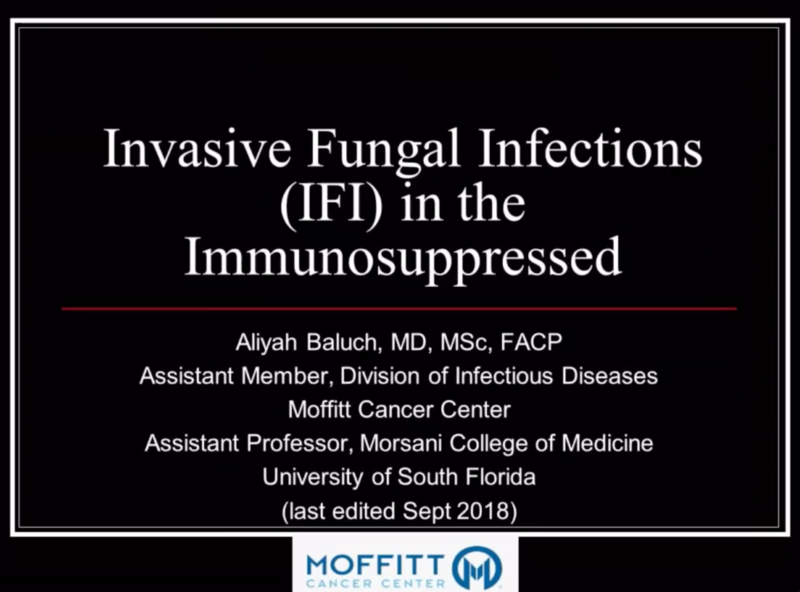 Dr. Baluch reviews the topic of invasive fungal infections (IFIs) in individuals who undergo hematopoietic stem cell transplantation (HCST). The author begins by reviewing risk factors for IFIs. She then discusses what constitutes an IFI. She differentiates infections caused by yeasts versus those due to molds, and discusses the assessment and management of invasive candida disease. Next, Dr. Baluch discusses non candida molds, including aspergillus, fusarium, and Mucor as well as atypical pathogens such as Pneumocystis. She closes with a discussion of antifungal therapy and what constitutes the ideal fungal agent. 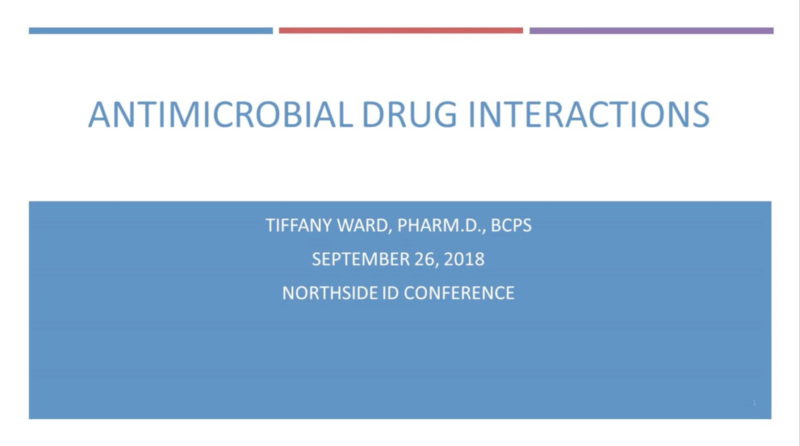 Dr. Ward reviews basic concepts about antimicrobial drug interactions. She begins by discussing the basic classification scheme, and then moves on to discuss several commonly recognized adverse drug interactions, as well as some that are commonly forgotten. She also reviews the topic of QT drug prolongation, the interaction between daptomycin and statins, as well as the most relevant azole interactions. She reviews serotonergic interactions, especially with linezolid. Lastly, she reviews the interaction between valproic acid and carbapenems. And the best reference sources for reviewing adverse drug interactions with antimicrobials are also discussed. 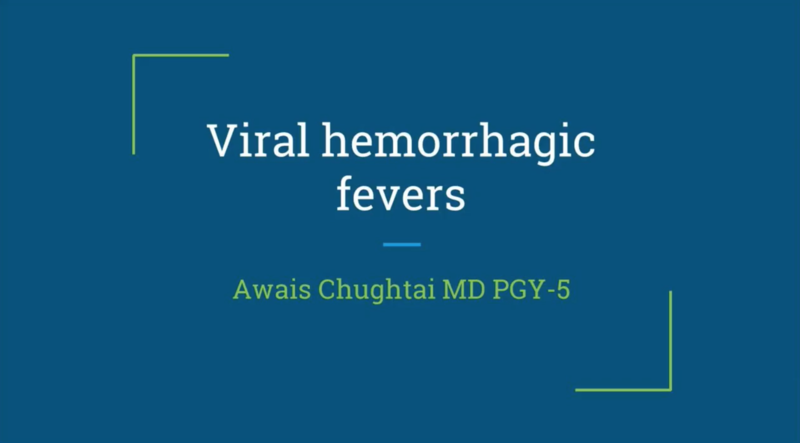 Dr. Chugtai reviews the family of Viral Hemorrhagic Fevers. He starts out by discussing transmission factors and major common symptoms for the class of disorders. He then covers the Bunyaviridae, including Hantavirus Pulmonary Syndrome and Rift Valley Fever. Dr. Chugtai then mentions the hemorrhagic fevers, including Ebola and Marburg viruses. Other hemorrhagic fevers dicussed includes Nipah virus disease and Hendra virus disease. Lastly, he discusses the flaviviruses, including Tick-borne encephalitis (TBE). 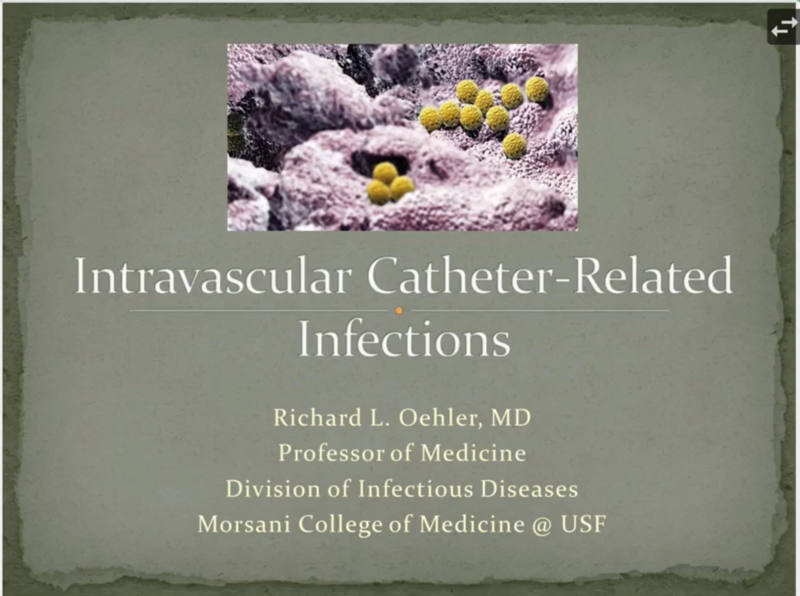 In this updated talk, Dr. Oehler discusses the assessment and management of infections of central catheters. Dr. Oehler begins his talk by covering the epidemiology of central line infections, including the most common organisms involved, and covers the different types of intravascular devices. 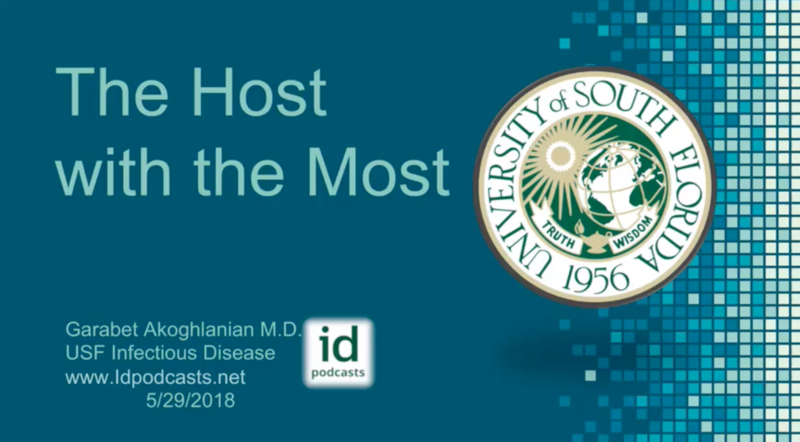 He then discusses the mechanisms by which central line associated bloodstream infections (CLABSI’s) occur, differentiating hematogenous, hub-related, entry site, and infusate-related etiologies. He also covers infection risk factors, the diagnostic workup, and under what circumstances device removal is necessary. 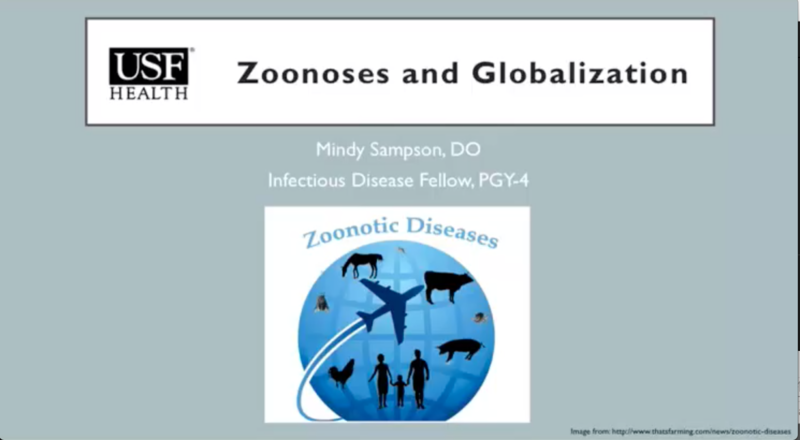 Infection management in the context of specific pathogens is also addressed. Furthermore, Dr. Oehler discusses the concept of antibiotic lock therapy and how it can be an adjunctive management strategy. Lastly, Dr. Oehler differentiates between insertion site and exit site infections where they relate to tunneled catheters and offers a summary of the 5 most effective approaches to reducing CLABSIs in the hospital setting. 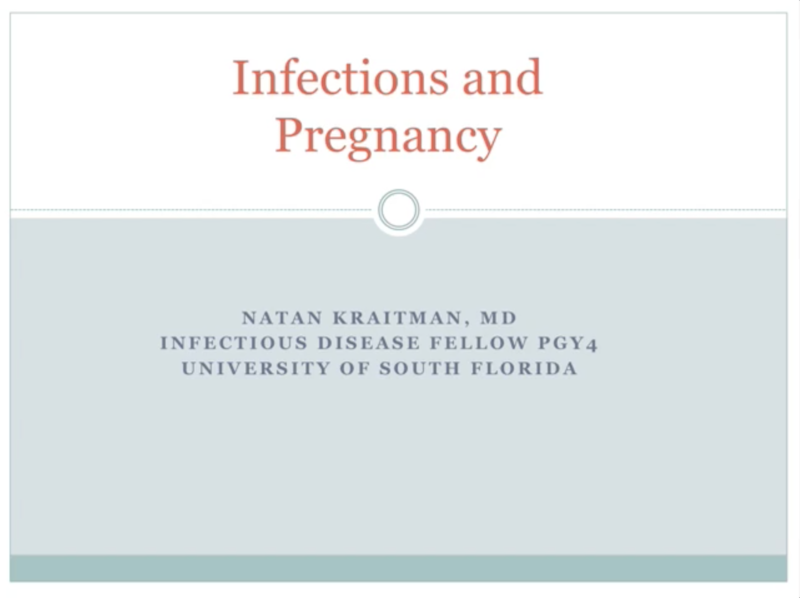 Dr. Kraitman reviews the management and treatment of infections occurring in the pregnant female. He initially reviews medication pregnancy risk categories, and then through interactive case review, goes over several examples where antimicrobial agents are used that are contraindicated in pregnancy. He reviews interactions relevant to HIV/AIDS, AIDS associated opportunistic infections, Tuberculosis, Malaria, CMV, Syphilis, and Listeria. He closes by providing information on useful reference resources for managing infections in pregnancy. The relationship between genetics and infectious diseases is explored. Dr. Akoghlanian also discusses the immune system’s innate and adaptive components, and presents pathogen-host interactions at different levels of the immune system. Lastly, the major types of iatrogenic, acquired, and genetic immune deficiencies are presented, including IgA deficiency, Common variable immhunodeficiency, terminal complement deficiency, MPO deficiency, Chediak-Higashi syndrome, CGD, and others. 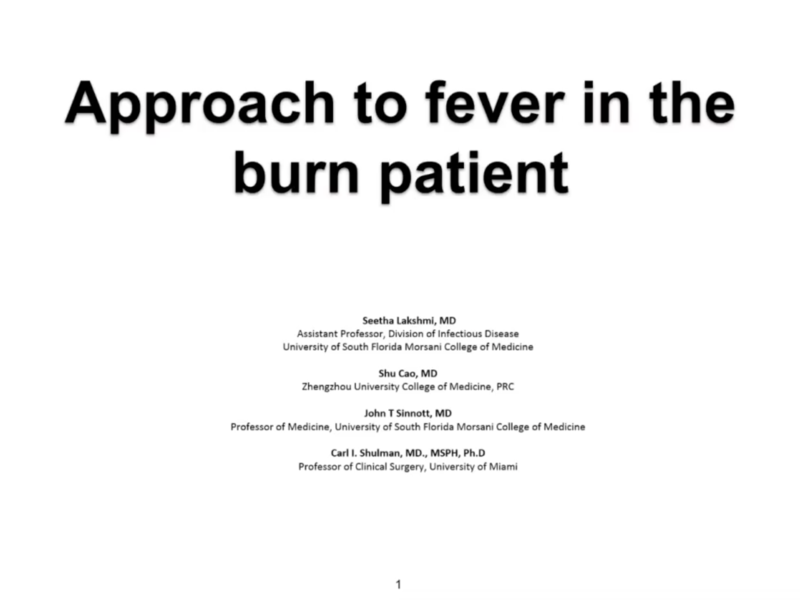 Dr. Lakshmi discusses the infectious evaluation of burn patients. She relates the common sources of fever, the principles of burn management, and both common and uncommon infections in the burn victim. Lastly, she mentions other infectious conditions not directly related to the burn exposure that must also be considered. 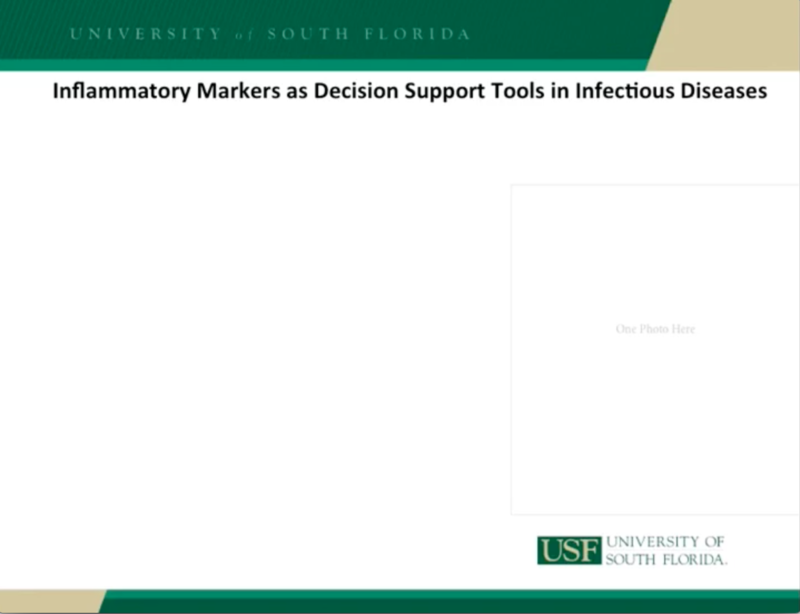 Dr. Addisu looks at inflammation, and how it can be used as a marker of certain physiologic processes such as infection. He then differentiates the different types of acute phase reactants that are well-described markers of inflammation. He focuses upon the two most widely used markers, the erythrocyte sedimentation rate (ESR) and the C-reactive protein, and compares and contrasts the two. Next, he discusses the procalcitinin and the white blood cell (WBC) count. He closes by contrasting the activity of different inflammatory markers (IM’s) in infectious syndromes such as sepsis and endocarditis, and briefly touches upon several novel assays which show promise as IM’s of the future. Drawing inspiration from sessions she attended at IDWeek 2017, Dr. Fredenrich discusses the sociological aspects of antimicrobial stewardship, including the strategies that can be employed to change the prescribing habits of frontline clinicians. She discusses the social determinants of antibiotic prescribing, such as clinician-clinician relationships, patient expectations, fear of adverse consequences, and other pressures. 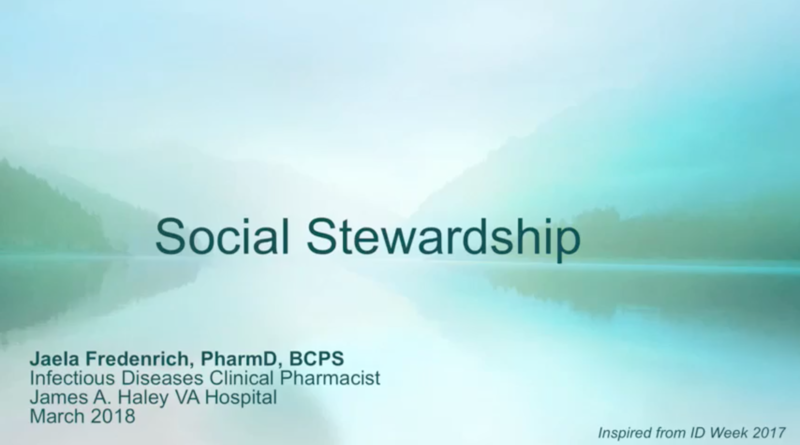 Dr. Fredenrich also discusses everyday barriers, such as trust-building and knowledge sharing that can improve the overall success of an antibiotic stewardship program.